For member access to all issues published by Springer, go to the 'Member Access Page' . 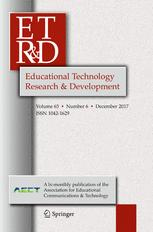 Educational Technology Research and Development is the only scholarly journal in the field focusing entirely on research and development in educational technology. The Research Section assigns highest priority in reviewing manuscripts to rigorous original quantitative, qualitative, or mixed methods studies on topics relating to applications of technology or instructional design in educational settings. Such contexts include K-12, higher education, and adult learning (e.g., in corporate training settings). Analytical papers that evaluate important research issues related to educational technology research and reviews of the literature on similar topics are also published. This section features well documented articles on the practical aspects of research as well as applied theory in educational practice and provides a comprehensive source of current research information in instructional technology. The Development Section publishes research on planning, implementation, evaluation and management of a variety of instructional technologies and learning environments. Empirically-based formative evaluations and theoretically-based instructional design research papers are welcome, as are papers that report outcomes of innovative approaches in applying technology to instructional development. Papers for the Development section may involve a variety of research methods and should focus on one or more aspect of the instructional development process; when relevant and possible, papers should discuss the implications of instructional design decisions and provide evidence linking outcomes to those decisions. Each issue also includes book reviews, international reviews, and research abstracts.